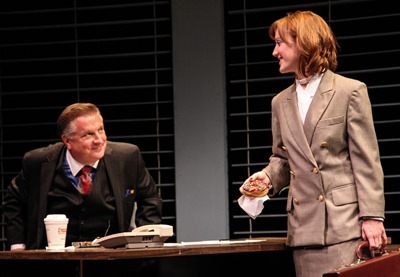 And Larry Garfinkle is authenticated, I mean thoroughly inhabited, from his three-piece suits to his vulgar charm, in Ben Werling’s portrayal at the center of Shattered Globe Theatre’s fascinating production directed by Dennis Zacek. Werling, a big guy to start with, grows to stage-filling splendor as the roguish biz whiz and rakish womanizer who doesn’t bother with seduction, unless a girl is turned on by a come-on that leaves niceties aside like a trail of shed garments leading directly to the bed. Larry Garfinkle is a busy man, and very successful on all fronts. His sights here are set on New England Wire and Cable, a longstanding family business that’s been under-performing and appears ripe for a hostile take-over. Larry shows up at the company’s main office with a good grip on the relevant numbers and an offer that should make the owner and the stockholders very happy. True, the company’s 1,200 employees will be out of work when Larry shuts down the operation and sells off its assets, but that’s not his problem and it shouldn’t be the owner’s, either. If all invested parties just keep their eye on the financial target, everybody scores a bull’s eye. But when Larry walks into New England Wire and Cable, he finds in owner Andrew Jorgenson his ethical opposite, a man who regards his employees as old friends and feels responsible for their well-being. With Larry’s audacious move not to be ignored, the old boss and his longtime assistant – and ladyfriend – rope her daughter, a fearsome lawyer with a high-powered firm, into leading the resistance effort. What follows is outrageously funny and, in its unvarnished plausibility, stunningly crass. Werling’s magnificently appealing predator and Abbey Smith’s savvy, fiercely feminist lawyer take confrontation to the level of a prize fight, in round after round of bobbing and weaving, punching and counterpunching, first one down for a long count, then the other. Larry, of course, would like to see them both down at the same time. Smith’s alluring lawyer answers her opponent’s coarsely direct style with evasion tinged with a hint of vulnerability. The question is, who’s kidding whom. When Larry first receives the lawyer with an offering of donuts, she declines, explaining that she’s not hungry. What, asks the flummoxed hustler, does hunger have to do with eating donuts? He could say the same thing about devouring sweet businesses. Director Dennis Zacek keeps the tide of events ebbing and flowing between designer Andrew Hildner’s left/right office sets for Larry’s lair and the weathered space occupied by New England Wire and Cable’s headstrong leader, played with curmudgeonly determination by Doug McDade. 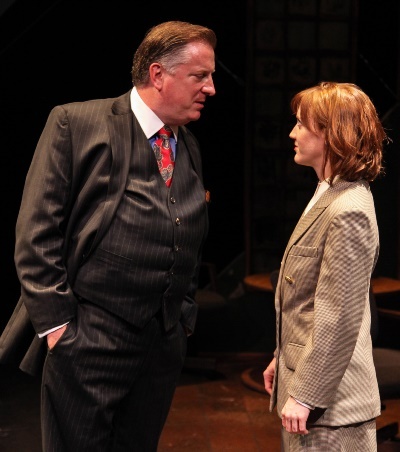 The frantic debates over what to do are credible between McDade’s tough old-school boss and his timeless, romantically attached assistant (Linda Reiter in a textured, knowing performance). One moment of crazy relief pops up when the old twosome spring a donut tree on Larry. But hovering on the fringe of all this, the odd man out, is the boss’s heir-apparent (Joseph Wiens), who’s about to see his future go up in smoke but who also may have something to say about the whole affair. 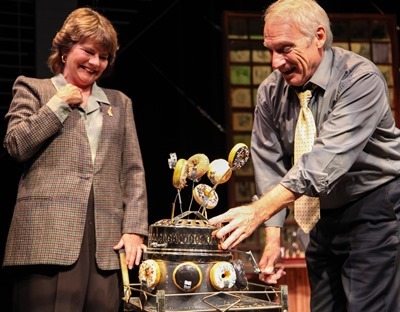 “Other People’s Money” ends, well, the way it ends – the way of the world. Larry the Liquidator brings a clear message to folks who don’t want to hear it. Whether he’s a bad guy or a white knight is in the perspective of the investor or the worker. Or the shark-eating lawyer.